You will be given a reference e-book to read which has 647 pages And the test will be based on that e-book , you can take the test only after 10 days Of &nbsp;purchase. What is Advanced Project Management? Advanced project management is defined by experts as a process designed to help project managers and decision-makers in carrying out their tasks even if they face certain changes in the way projects are managed. The entire process is also known to have the ability to produce long-term and more desirable results regardless of how complex projects are. If you want to take part in an advanced project management certification program, then rest assured that you can gather all the information that you need about this field. You will know the essential elements of advanced project management including driving forces for metrics, targets for metrics, key performance indicators, dashboards, metrics management and value-based metrics and how you can apply these elements into your project with an aim of becoming successful. It should also be noted that being an advanced project management expert requires you to hone a few of your management skills including those that relate to completing an established project, improving the efficiency of an organization, enhancing your knowledge about the most advanced strategies in executing projects, understanding the principles behind change control and scope management, communicating the progress of your projects in the most effective manner possible and familiarizing yourself about the most advanced project control software including Microsoft Project. Advanced project management is also known as an effective approach when it comes to improving the competitiveness of an organization while effectively managing changes, leading cross-functional teams globally and improving profitability and productivity. The ISO certification received by Brainmeasures just indicates that this online company can offer you the kind of help that you need when you are aiming to get your advanced project management certification. Operating under strict ISO standards just shows that the advanced project management certification program that you can access from Brainmeasures can give you the best training possible because it offers a hundred percent guarantee that it is comprehensive. You also have an assurance that the program was developed with the help of the professionals and experts from Brainmeasures. The project management exam that you need to take and pass at the end of the certification course is also authentic since it is made by experts. It is free of errors and guaranteed to work in testing your capabilities as an advanced project management professional. Your skills certificate will be given to you after passing the exam. Note : To view detailed Syllabus you have to register with Brainmeasures and if already registered just login to your individual account. 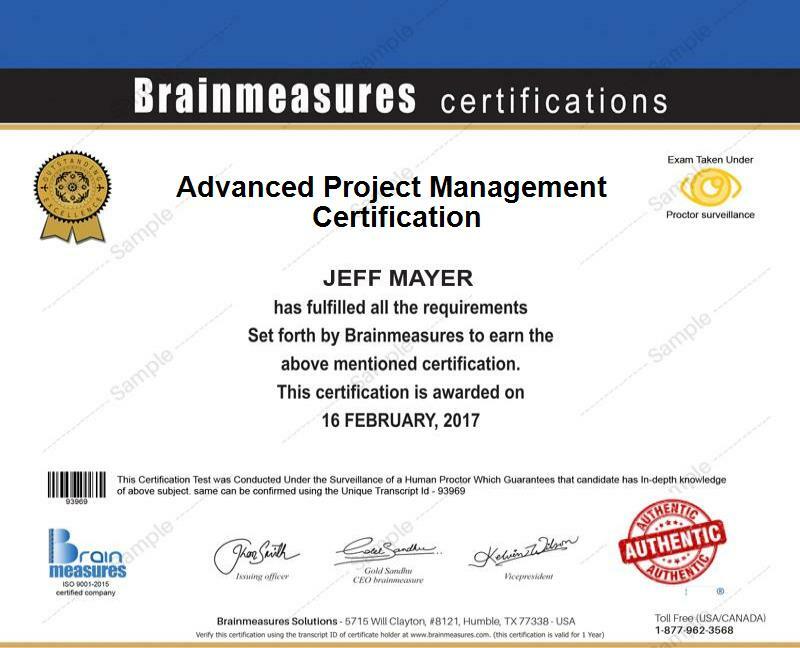 While the advanced project management certification program from Brainmeasures is ideal for everyone, you should know that there are people who can gain more benefits from it. Among these people are project managers, project coordinators and managers who aim to successfully carry out a project with the help of more advanced techniques and strategies. Being an advanced project management certification holder can offer advantages to you in terms of earnings as you can expect to receive better pay through this. An average annual salary starting from $70,000 up to $107,000 can be expected after receiving your certificate.